The situation is even more unstable today, now that we have entered an ecological mutation of unprecedented scale. Some call it the Anthropocene, but it is best described as a new climatic regime. And a new regime it certainly is, since the many unexpected connections between human activity and the natural world oblige every one of us to reopen the earlier notions of Nature and redistribute what had been packed inside. So the question now arises: what will replace the old ways of looking at Nature? 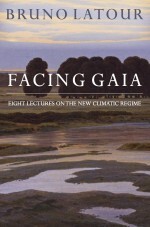 This book explores a potential candidate proposed by James Lovelock when he chose the name “Gaia” for the fragile, complex system through which living phenomena modify the Earth. That he was immediately misunderstood proves simply that his readers have tried to fit this new notion into an older frame, transforming Gaia into a single organism, a kind of giant thermostat, some sort of New Age goddess, or even divine Providence. In this series of lectures on “natural religion,” Bruno Latour argues that the complex and ambiguous figure of Gaia offers, on the contrary, an ideal way to disentangle the ethical, political, theological, and scientific aspects of the now obsolete notion of Nature. He lays the groundwork for a future collaboration among scientists, theologians, activists, and artists as they, and we, begin to adjust to the new climatic regime.